This is often the first question asked and the last thing anyone wants to answer, especially on a website. ‘It’s important to sell the value before revealing the price’ is quite rightly what the pricing experts will advise. However, it also gives the impression that you are somehow ashamed or embarrassed about your fees if you don’t reveal them, especially if a potential customer has taken the time to research your website or search the answer via a search engine such as Google. I’ve no doubt that you’re only reading this line now after you’ve scrolled to the bottom to look for the figure and not found one. This is a reason why it’s not wise to send out your proposal to clients in the post, it doesn’t matter how much you build up the value in your proposal letter, or email, it’s unlikely to be read. The prospective client will flick through the pages of the letter or scroll through the email straight to the bottom to look for the price. These conversations are best had face to face. Seeing the price in isolation is just a number and that number can either seem high or low depending on preconceived notions. Let me ask you a rhetorical question. Which is the most important? The price? Or the return on investment and the period of time before you get the returns? I expect you appreciate that it’s the return on investment and the period of time you can expect to see great results that’s the most important. So, I’ll happily be open and share the price of membership. Firstly, I’d like to share with you some brief examples. When Phil from Northern Accountants in Leeds joined AVN he was working so many hours that his marriage was in tatters, he wasn’t seeing his children and was struggling so much financially that he couldn’t afford to pay his household bills. Within 2 weeks of joining AVN he generated enough in additional fees to pay for his AVN membership for the next 12 months. That was a 12 x financial ROI in 2 weeks. This trend continued enabling him to become much more profitable, recruit a team of people and grew his practice from a struggling £50K to over £1,000,000 in just four years. Why did Phill progress at such a pace? Well, it wasn’t luck that’s for sure! Phil is an action taker, he implemented the strategies we shared, he used the resources we gave him, in exactly the way we suggested and he got the results. Not only did he grow his client base organically but he grew it in a way that he was attracting the right clients for him that would be receptive to the added value and business growth advisory type of work that he wanted to deliver making the average fee per client incredibly high. Phil has complete choice about the hours he works as his team deliver everything to his clients including acquiring new clients. A link to watch his case study video is at the bottom of this article. The emotional return on getting to spend all the quality time he wants to with his wife and children is priceless. Paul from SFB group in Nuneaton was the sole partner of a previously 6 partner firm, as each had retired, he’d invested in to and bought their equity shares. The result wasn’t what he’d expected. He was in high demand by 6 partner’s worth of clients, 30+ employees bringing him more problems than solutions and was at the end of his tether. He transformed his practice from 800K turnover and barely any profit to what is now over £6,000,000 incredibly profitable firm. Again, Paul implemented the actions and made stuff happen. Paul has complete choice about his hours, his team run and deliver all of the services within the practice. A link to watch his case study video is at the bottom of this article. I’ve shared these two examples of fast and high levels of growth in an accountancy practice. Of course, not everyone wants to create an empire of these levels. Some Accountants want to build an accountancy practice that is giving them the level of income they deserve, working sensible hours and enjoying their practice. There are lots of great examples of these achievements in the Case Studies section of our website. Their respective journeys are different to some extent and similar in others. AVN provide every single AVN Member with their own personal Practice Growth Expert and it’s important that there’s a good chemistry match here. We have many Practice Growth Experts that are fully trained and accredited that help AVN members progress through our 7 stage roadmap, you can discover more about this by clicking the link at the bottom of this email. That roadmap is a strategic plan on both a macro and micro level but the first stage is 100% tailored to the unique starting position of each Accountant we begin working with. Their current situation will be unique and so it’s important to help each get to a point where they’re working only sensible hours so they can spend more time with their families, they’re generating a better income so they’re not worried about finances and they’re enjoying and getting a great sense of fulfilment in what they’re doing in their practice so they actually look forward to each and every day. For us the return on investment we help our customer achieve is not only a financial one although of course that is important, but it’s in those 3 areas. Earning more, working less hours and enjoying running the practice, getting a greater sense of fulfilment. That’s the primary focus and usually achieved within a maximum of 3 months. AVN can be likened to joining a gym, you’ll have a personal coach and access to lots of great strategies, a proven structured programme, tools and resources that will accelerate your journey to success but if you don’t commit the time to making them happen you won’t get the return. Sadly, sometimes we have had Accountants join us before, they know something has to change in their practice, they’re not happy, they’re working too many hours and their relationships at home are strained or ruined, their own stress levels are affecting their health and yet, despite knowing that something has to change, they put off making stuff happen. The reasons for this are that they fear making the changes, they worry that they’ll lose what they’ve spent so long building if they make changes, they fear that their clients will leave them. We’ve made leaps and bounds improvements over the years in terms of helping accountants that have these fears in the way we run our workshops. Most fears are simply in the mind, they’re ‘what if?’ scenarios. By including role play scenarios, helping you better handle objections, helping you practice in a safe environment you come away feeling much more confident about implementing the actions and the reality is that those fears were in most cases an exaggerated worst case scenario. We know this stuff works and helping our AVN members build confidence to implement it is important because they get terrific results. We’re so confident that it works that we have guarantees in place that if in any month an Accountant that we’re working with doesn’t feel that they’ve had value then they can request that month’s investment back. The decision about value of AVN membership is month by month and so it’s in our interests to ensure that we give and deliver outstanding value every single month. When we take on a new member we work with them to understand what their immediate needs are and what a return on investment looks like to them and within the first 3 months our aim is to ensure that they are by far exceeding return on investment. There are three packages of membership within AVN depending on the level of support, and therefore how quickly they wish to accelerate their journey to achieving the level of success they want to achieve. The foundation package is five hundred and sixty seven pounds per month. I’ve written this in words rather than numbers to prevent that dreaded scroll down glance for the price. That fee is dwarfed by the financial and emotional rewards that AVN members get. I’m sure you’ll agree that AVN wouldn’t have recently celebrated its 20th year having helped over 2600 accountants during that time if what we were delivering didn’t get the results and fast. If you’re interested in experiencing AVN we offer a fully guaranteed trial – phone or email to get further information. 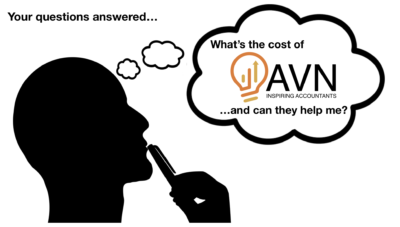 If you haven’t come across AVN before and don’t know very much about us, why not deepen your understanding of us, implement some of the learning that you can get access to for free and start to experience some of those results now without any obligation whatsoever to do more with us. 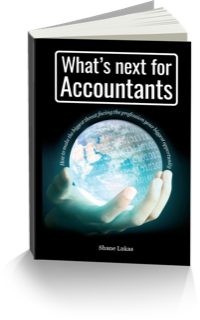 The best way to do this is to download a free copy of my Amazon #1 Best Selling book, What’s Next For Accountants. In this book I openly share strategies and methodologies that you can both apply to your practice to strengthen it and that you can share with your clients to help them grow their business, it helps you position offering these services as a paid-for service too. In addition, once you’ve downloaded that book you’ll also get access to my online free training program called Improve Your Practice where I share additional strategies you can implement, this also gives you access to my live webinars that I run on average every 3 weeks that address current and pertinent challenges that accountants in practice typically face with ‘how to’strategies to overcome them. This is a great way to dip your toe in, get a feel for the type of value we can bring to you. If and when you’re ready to discover more about how we can help you accelerate the growth of your practice whilst simultaneously reducing the personal burden and pressure on you. we can have a chat. I promised to give you links to the case studies I referred to. The overview of the 7 stage roadmap is here.